Now parents, be honest, who wants their children to be a doctor when he or she grow up? If I were to pose the above questions in a room of 100 parents, I would probably see 90% of the hands raised ( mine included ) , so when the opportunity came to experience being a 'Doctor for a day', we were more than happy to participate. 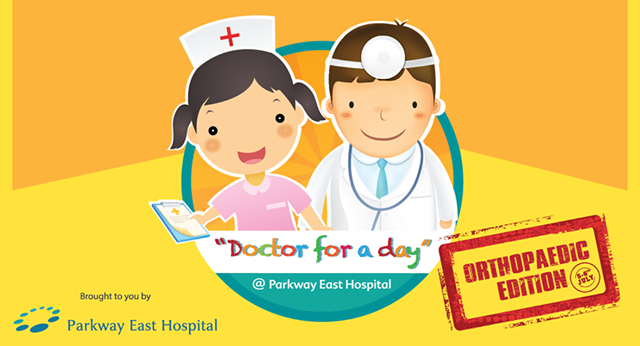 The popular 'Doctor for a day ' workshop for children age 5 to 10 is back. This time it was held at Parkway East Hospital. The workshop was so popular that spaces were filled up within days of it's launch. We were lucky to have score an invite for this event, else we would most likely miss this opportunity to 'fulfill' a dream most parents would love to have. Since the workshop was meant for age 5 to 10, only Big C qualifies for it. On the beginning I was a little apprehensive if he would participate, given that this is quite similar to a drop off event where parents would not be with the child. Moreover his 'brother-in-crime' was not there to participate with him. On the contrary, the boy was more than eager to attend as evident by his enthusiastic remarks such as ' Is it time to go to the hospital now? ' for the nth time! Hi, I am your Doctor for a day! 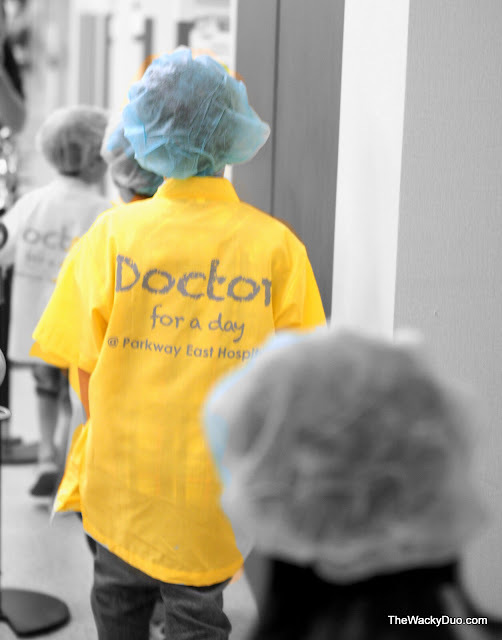 The event started with the donning of a Doctor's uniform and headgear to prep the children for the task ahead. Ushered into a room, they were warmed up with an eight step technique for washing hands. Conducted by real doctors and nurses, it does give the little ones the opportunity to 'train' with the pros. After the warm up, it is good to go for the little Doctors for the day. The event is billed to be an Orthopedic Edition. Orthopedics is a branch of surgery that focus on conditions around the musculoskeletal system. So I guess they will be learning a thing or two on performing bone surgery. This 90 minutes event brings you through 5 different stations. 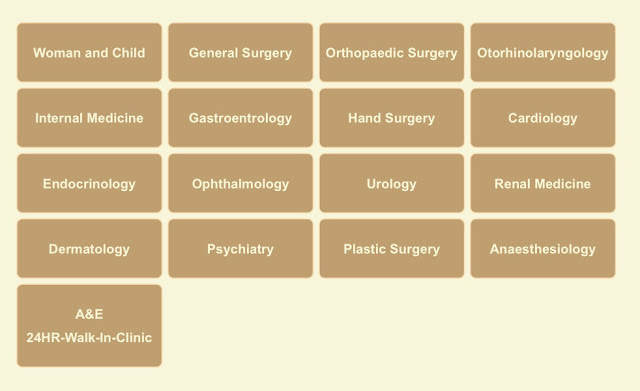 To start off , the doctors honed their general skills by being General Practitioner. There they were given stethoscope and thermometers to train to 'diagnose' a patients health. Next up was the accident and emergency department where the little Orthopedic doctors were taught how to bandage cuts and sprains. Doctor , I have a cut! The workshop was well conducted with several hands-on opportunities for the children. Take for example at the Accident and Emergency section, the children used themselves as casualties for treatment. The children were too engrossed with the workshop that most forgot the presence of the parents outside the rooms. Speaking as a parent looking from outside, it was a pleasant and proud experience watching my son participate in the workshop. I am sure the hundreds of parents eagerly snapping photos of their love ones in action would agree with that. The experience continues with a trip to the nursing room where the children learn to change diapers and recognize the needs of the babies when they start wailing. Ahh... If only this lesson was done 4 years ago, it will be useful to have an additional pair of hands to look after the baby. The final hands-on session is at the operating room, where the doctors will attempt to do a bone surgery on the patient. After a tough day at work, the little doctors had their photos taken at the X-ray room. Upon completion, they will receive a certificate for completing doctor for a day... Too bad, this is not the real deal as most parents would have hope for. In the distant future, this might be a reality for us. For now we can only savor the experience. Unlike previous editions, this workshop now cost $25 per child. However you would be please to know that for every registration, the hospital will match with $300 to sponsor total knee replacement surgeries for needle elderly. We think this cause is totally worth it. In addition to the experience, each child also gets to take home a goodie bag which includes a cute patient/ doctor teddy bear! 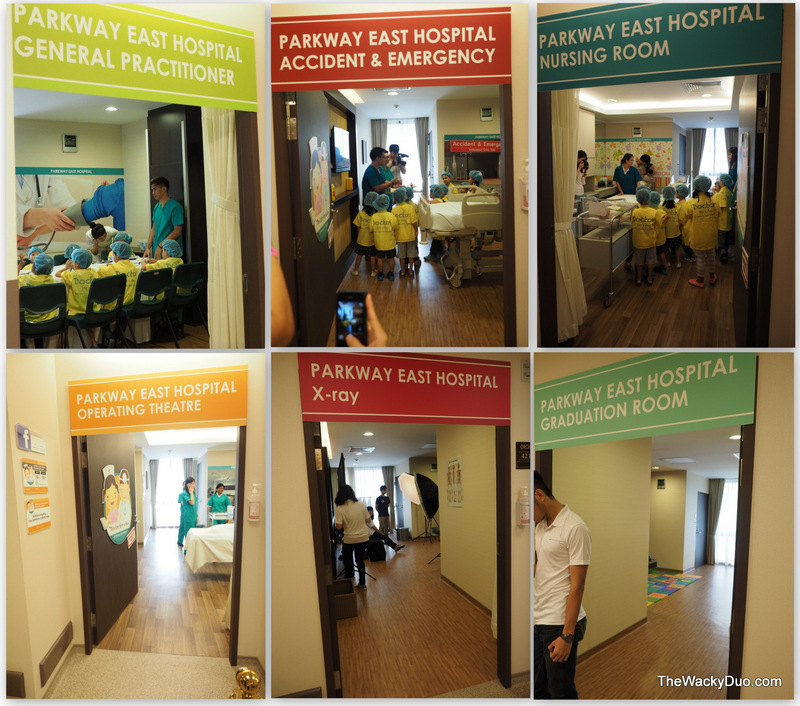 It was a very decent 15 minutes per station to get the little doctors expose to various parts of the hospital. Overall we think that the workshop was well done and it did expose the little ones ( and their parents ) to the various roles a doctor does. In addition, it also serve to highlight to the parents the different departments at Parkway East Hospital. This is always a good to know in case we need any medical treatment. There were other activities at the hospital foyer open to the public on that day. We think it is a good gesture from the hospital to open it to the public especially when spaces for 'Doctor for a day, were limited. Thanks to Parkway East Hospital, the boy had a chance to be a doctor for a day, while I will remember this moment and hope it may be permanent in the future!